289 people in our community are currently praying with you. The Taize Community is an ecumenical Christian monastic order in France. This beautiful Kyrie is sung in a number of languages (I recognize five). O God, who makes us glad with the weekly remembrance of the glorious resurrection of your Son our Lord Jesus Christ; Give me this day such blessings through my worship of you, that the days to come may be spent in your service; through the same Jesus Christ our Lord. Blessed are you, Lord God of my salvation, to you be praise and glory for ever. As once you ransomed your people from Egypt and led them to freedom in the promised land, so now you have delivered me from the dominion of darkness and brought me into the kingdom of your risen Son. May I, the fruit of your new creation, rejoice in this new day you have made, and praise you for your mighty acts. Blessed be God, Father, Son and Holy Spirit. For I know my transgressions, and my sin is ever before me. Against you, you only, have I sinned and done what is evil in your sight. I am full of shame at my sin, and my heart lies heavy. Purge me and I shall be clean; wash me, and I shall be whiter than snow. Let me hear joy and gladness; Hide your face from my sins, and blot out all my iniquities. This I ask in the name of Jesus Christ our Lord. Finally, may I go forth filled with the joy and confidence of your Spirit; and may everything I do this day, in word or deed, be done in the name of the Lord Jesus, giving thanks through Him to God the Father. How long will scoffers delight in their scoffing and fools hate knowledge?" So he came again to Cana in Galilee, where he had made the water wine. And at Capernaum there was an official whose son was ill. When this man heard that Jesus had come from Judea to Galilee, he went to him and asked him to come down and heal his son, for he was at the point of death. So Jesus said to him, "Unless you see signs and wonders you will not believe." The official said to him, "Sir, come down before my child dies." Jesus said to him, "Go; your son will live." The man believed the word that Jesus spoke to him and went on his way. 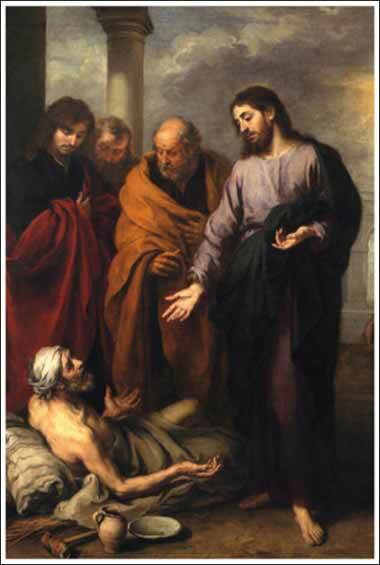 As he was going down, his servants met him and told him that his son was recovering. So he asked them the hour when he began to get better, and they said to him, "Yesterday at the seventh hour the fever left him." The father knew that was the hour when Jesus had said to him, "Your son will live." And he himself believed, and all his household. This was now the second sign that Jesus did when he had come from Judea to Galilee. This story of the second "sign" of Jesus' divinity involves the question of faith and proof. Christ says to the man that, unless he sees signs, he will not believe. Yet we today are expected to believe, without signs or miracles. Nobody can answer this difficulty to satisfy everyone. Some people find "miracles" that others (usually a large majority) find silly or unconvincing. Many people seek desperately for a sign from God, or a true miracle — a fabulous and unexpected occurrence, usually something that does a great good to somebody, with no logical explanation — without ever finding one. You might say that the miracle is life itself; every day is a miracle and contains a million small miracles. This is how I feel, personally. But if you sometimes feel shaky in your faith, because your eyes and ears do not witness a direct sign from God, don't despair. Almost every Christian feels them, to some degree, at some time. Even Mother Theresa, in her diaries, recounts crises of faith. And yet we come back to our faith. It seems like there is something in us, perhaps our soul, that brings us towards God as surely as a tulip's leaves grow towards the unseen sun from the dark underground. 2 Peter 1:19: First of all you must understand this, that no prophecy of scripture is a matter of one's own interpretation, because no prophecy ever came by human will, but men and women moved by the Holy Spirit spoke from God.